In this study, we will look at the biblical teaching regarding Immanence and Transcendence. As in previous studies, we will look at definitions, scriptures, commentary evidence, dictionary entries and portions of essays for the purpose to glorify God in how we live. May God be glorified always! “A word used to convey the idea of God indwelling His creation and its processes. It is the counterpart of transcendence, * which emphasizes His distinctness from and total sovereign superiority over His creation. Pantheism is immanentistic: it, in fact, identifies God with the universe. Another form of immanence is the notion of theistic evolution: God is viewed as always acting “naturally” (i.e., within the course of nature and by means of natural development) and not supernaturally. “The theological term that emphasizes the distinction of God from His creation, and His sovereign exaltation over it. In the popular phrase of Barth, God is “wholly other.” He is not part of the universe. He is not the sum of the parts of the universe. He is not the soul of the universe. He is the eternal, uncreated, absolute, self-contained, self-existent, sovereign Creator by whose will and power all things exist. They depend on Him for their being; He depends on none. “The incommunicable attributes of God stress his transcendence and the communicable attributes stress his immanence. The two imply one another. 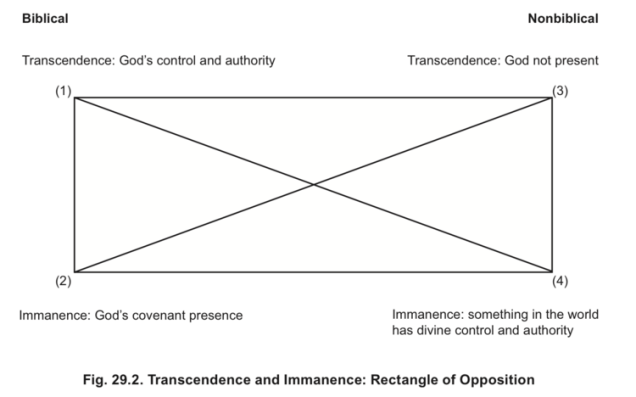 A Christian notion of transcendence and a Christian notion of immanence go together. “However, peculiar this type of philosophy may be, contemporary Protestantism is largely dominated by it. The Neo-orthodox ministers may talk about god and revelation, but they do not have in mind the objective God and the objective revelation of the Westminster Confession. They do not believe that the Bible tells the truth. For example, Emil Brunner, who through his books and through his one-time position in Princeton Theological Seminary has become popular in the United States, is so far removed from the Confession that he holds neither the words of Scripture nor the thoughts of Scripture to be the truth. To quote: “All words have merely an instrumental significance. Not only the linguistic expressions but even the conceptual content is not the thing itself, but just its framework, its receptacle, and medium.” A few pages later he continues, “God can…speak his word to a man even through false doctrine.” God then reveals himself in falsehood and untruth. What a revelation! With such skepticism, it is not surprising that their religion consists in a passionate inwardness that appropriates nothing objective. Unfortunately, skepticism, particularly when discussed in such an academic tone as this address, does not provoke as passionate a reaction among the evangelically minded as it ought. But one ought to realize that even the most gentle and innocuous skepticism is sufficient to defeat the Gospel. To speed the dissolution of Christianity, it is not necessary to say that we know a contrary philosophy is true; it is equally effective to say that we do not know anything is true. The Gospel is a message of positive content, and whether it is dogmatically denied or merely silenced makes little difference. The Christian God is transcendent above and beyond creation and the creator of all things. The Christian God is not surrounded by mystery since He is the author, creator, and controller of history and space/time universe. The transcendence of God should be understood as being connected to His divine sovereignty. The transcendence of God means that He is above, different than, and separate from His creation. The Christian God is also immanent. His immanence means that God is within or near His creation. Immanence is intimately related to God’s omnipresence, in that God is always present within the universe, though separate from it. God is within the universe and is its sustaining cause. To argue for God’s transcendence only and deny God’s immanence leads to deism. On the other hand, to deny His transcendence and argue for His immanence leads to pantheism. 1. John Gill, Exposition of the Old and New Testaments, Jeremiah, 9 Volumes, (Grace Works, Multi-Media Labs), 2011, pp.422-423. 2. H. D. M. Spence and Joseph S. Exell, The Pulpit Commentary, Isaiah, Vol. 10, (Grand Rapids, Michigan, Eerdmans Publishing Company reprint 1978), p. 330. 3. Alan Cairns, Dictionary of Theological Terms, (Belfast; Greenville, SC: Ambassador Emerald International), pp. 184-185. 4. Alan Cairns, Dictionary of Theological Terms, (Belfast; Greenville, SC: Ambassador Emerald International), p. 413. 5. Cornelius Van Til, The Defense of the Faith, (Presbyterian and Reformed Publishing Company, Phillipsburg, New Jersey), pp.11-12. 6. Gordon Clark, God’s Hammer: The Bible and Its Critics, (Jefferson, Maryland, The Trinity Foundation), p. 192-194.
user reviews that it’s gotten.